The word SSR is an ellipsis for Simplicity, Smartness and Reliability. Creating exceptional and original products that are consumed with preference is our identity. We believe excellence can be achieved when one’s mission is to earnestly strive to make their vision a reality. Importunate discovery of the spirit of exploration, adventure and learning are at the core of this journey. It is the zeal with which one explores, that forms the foundation of achievement. With this impeccable understanding of the synthesis of the present and the future, SSR takes the roads less travelled and intends to carve a special place ‘on the taste buds and in the talks’ of their esteemed patrons worldwide. We are certain that a tacit inheritance of the understanding of the minds of the sovereignty would soon crown us as the first choice of our customers. Since the commencement of our research in the year 2010, ‘inexorable perseverance of the best’ has characterised our search for not only the perfect blends but also for their packaging. Care taken at choosing the most suitable water sources and places offering perfect environmental situations for the ageing these malts have enabled us produce magnificent results. Detailed study of various distillation processes worldwide, experimentation with their combinations and analysis of their results have enabled us crack the code of blends, which hitherto stood, only fantasized. Selection of food-grade packaging material is our last but never the least important step in ensuring highest quality of our products. Coupled with a sense of pride, this moment is a delightful occasion to present to you SSR’s signature alcoholic beverages from the categories of Whisky, Brandy, Beer, Wine, Gin, Tequila, Vodka & Rum. Several hundred hands and minds have worked together uncompromisingly to bring you only the best and I am certainly indebted to them for their diligence. I thank the entire team for producing these bottled miracles. Developing 30 different brands over a period of 5 years, each with its own distinct personality is certainly phenomenal. The Scottish blend of SSR gives the perfect feel of Scotland with its Sweet, Savory, peaty & smoky taste in every sip. Every blend native to one land truly represents traditions of the native blenders’. It is then both the vision and the mission of SSR to reach out to the world in any and every way to win widespread appreciation and applause for their hard work. 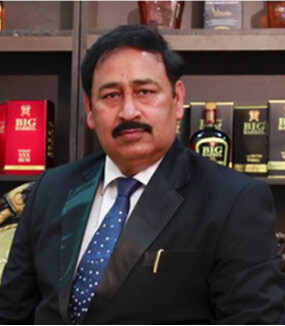 Encouraged by the Study & successful running pilot project at Uttrakhand, SSR decided to enter into competitive yet high growth market of Spirits in India, Nepal, Scotland, USA and Canada. With 1 trillion plus global market size of liquor, SSR will aim at acquiring 0.25% market Share from Asian , African, European & Canadian market thus venturing little more than 2 bn. value share by 2020. Therefore, SSR has introduced 14 products for mass market to cater 70% liquor market, 4 whisky segments to catch 75% whisky market, 4 Vodka, 3 Beer, Tequila for youth & women to cover high growth market, 2 Wine for Premium customers to attract Emerging market. This objective is firmly backed by own state of the art Production facility with an installed capacity of 10 million cases/annum in Northern & Western part of India. Our company has been certified with the ISO 9000 certification and FSSAI approved seamless processes are in place to ensure global standardization. We are proud to house a highly advanced Laboratory and a Blending Unit. I began with expressing gratitude towards my team for innovating and following the finest of practices in producing ‘not products but experience’ and I now conclude with a promise that it is going to be an experience of a lifetime..
SSR Group was founded in the year 2010 by the company Chairman, R.K.Sharma, with a clear vision to serve millions of consumers globally with its "Expert services" and "Quality products" through its core values - "Simplicity, Smartness Reliability". We have progressively grown to what we are today! SSR Group has already paved the path to achieve its goals and is and ready to move up to the next level. To start with, SSR Group has always looked forward to its entry in a wide array of services with a strong base of work ethics acquiring a clear vision to rise through the ranks and stay ahead of the competitors. SSR Group aims to build itself as a company and reach out to the mass through its multi-brand products. 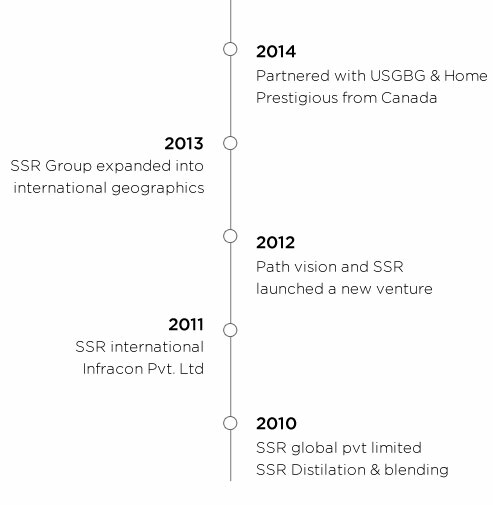 Currently, SSR Global has also entered into a joint venture with a third party manufacturing unit to expand the footprint for its own brands across the globe. However, the company will start its own production center for Bio-Spirit and Bio-Care products to enhance the customer experience.Our tremendous desire for growth, coupled with a large, satisfied client base is the golden key that has driven SSR Global to further glory. Globally recognized customer centric service provider - known for their innovative and revolutionized global business. We create Simple, Smart & Reliable products for our potential customers, providing ‘Value’ through ‘Innovation’. Service Sector: Consulting services, construction services, IT services and E-commerce services.